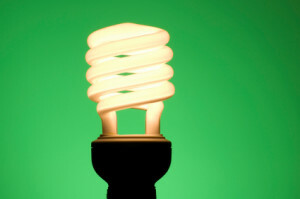 Why does my energy efficient lightbulb glow or flicker? Why do my energy saving bulbs glow or flicker when turned off? It’s night. You’ve turned all the light switches off ready for bed, when you notice your energy efficient light is quietly glowing to itself. Not enough to read a paper by, but enough to get your attention. If you are super-lucky it may even flicker every now and again – brightening and dimming. So what causes it? The most common cause is that your lights are on a two-way circuit or dimmer circuit. With those types of circuits, even though the switch is turned off you still get a tiny trickle of electricity through. Not enough to fully trigger the bulb to light – but enough to make it glow. Flickering comes in when the low power charges the in-built capacitors. Once the threshold is reached, the lightbulb pulses to start the bulb – but because the voltage is so low, it can’t stay alight. So it dims again – only to repeat the pattern. If your light bulbs are doing their best disco impersonation, your first step is to try changing brands of bulbs. Some brands seem more prone to flickering than others. You also need to make sure that if you have a dimmer circuit that you only use bulbs that are approved for dimmers. If you continue to get a glow or flicker, then give us a call to test the circuit for you.